We’ve heard the axiom that “truth is stranger than fiction,” but is that really true? After being a journalist for more than 20 years, I can assure you it is. It’s at least stranger than fiction that makes a sincere effort to be plausible. But that can be problematic. The storylines in true story don’t always fit together with a tidy story arc. They’re messy and not very artful. After all, it’s real life. So, as I pound away on my keyboard at telling some of the more riveting and compelling true stories — stories that make you laugh, cry, and everything in between — I’ve also decided to start sharing some fiction pieces that do have better plot lines and drip of artisian story telling. Best of all, I’m doing it on the eBook medium with Ampelon’s fiction partner StoneHouse Ink, meaning it’ll be easier to distribute as well as faster to market. 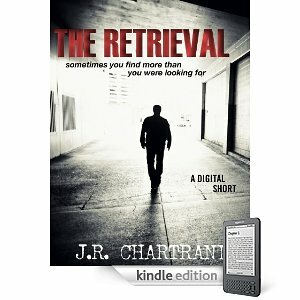 My first fiction piece (written under my fiction pen name J.R. Chartrand, which is worth another post on its own) is called “The Retrieval” because “sometimes you find more than you were looking for.” You can find it on all the normal eBook sites as well as at Amazon.com here. I would love to hear your feedback on the piece as well as leave comments on websites where you might purchase it. Even if you don’t like it, I can take it.